Used for score cutting cement based tile backer board and for degrouting work. Preferred by many for degrouting because handle style allows easy pulling through joint. Reversible, double edged blade has carbide tips for long life. 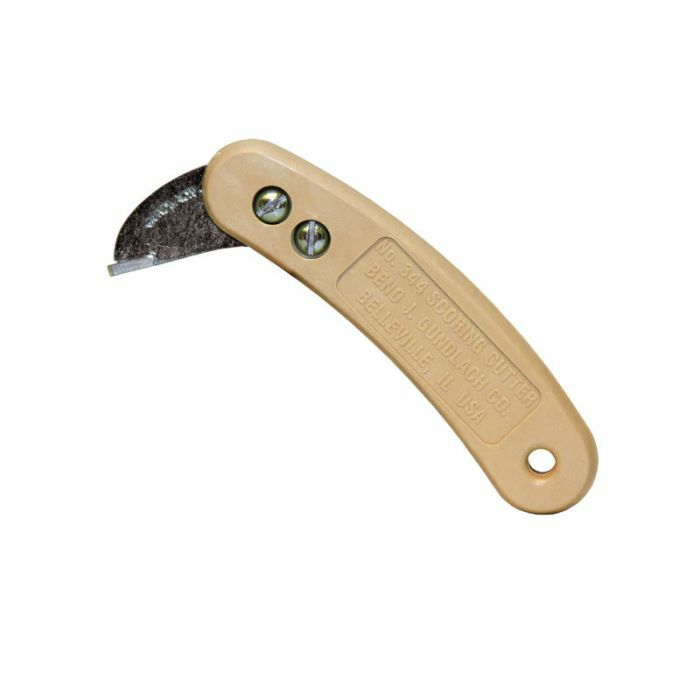 Featuring a double edged blade, this is a very popular, inexpensive and easy to use tool. The carbide tipped blade simply scores through the decorative surface, and the laminate breaks cleanly away. Ideal for both do-it-yourself and professional installers. Excellent for cutting self edging strips. Double edged blades are more economical. 1. Hold a straight edge firmly on the decorative surface of the laminate sheet, along the line to be cut. 2. Draw the Cutter firmly along the straight edge, scoring completely through the decorative face. The deeper the scoring, the easier it is to break the sheet neatly. This is especially important when making long or narrow cuts. 3. To break the laminate sheet, simply press down firmly on the straight edge (along the scored line), grasp the outer edge of the sheet, and pull upwards. The No. 344 Scoring Cutter is also used for score cutting cement based tile backer board and for degrouting work.